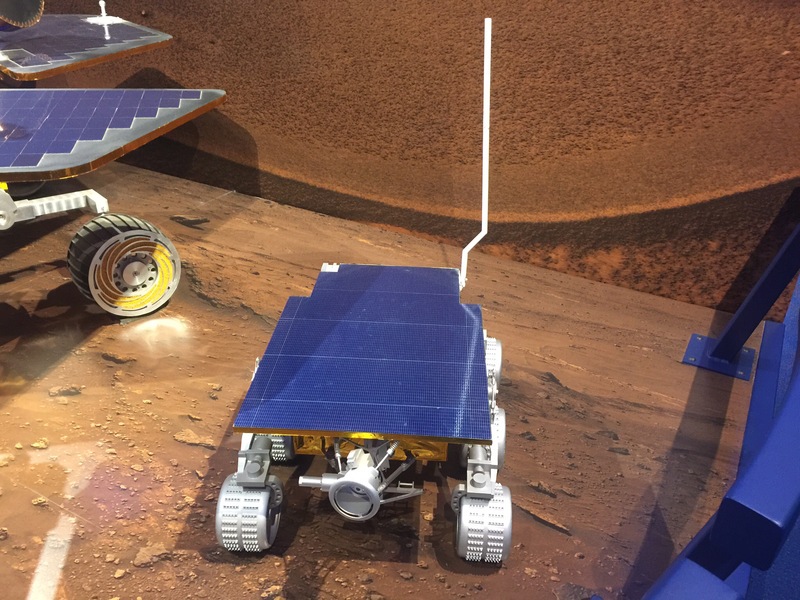 On Tuesday, We attended a tour of NASA’s Jet Propulsion Labs in Pasadena. This was a private tour that was arranged by our son Mike who works there. We had a group of about 20 people, most of whom were members of Mike’s 9SOPS unit at Vandenberg AFB. The tour started at a small theater to view a video about JPL. The lab was started by a couple of grad students at Caltech who were doing research on rocket motors. Here’s the wiki article. Around the edge of the room were several models of JPL space craft including a 1/2 size model of the two spacecrafts Voyager which were launched in 1977. 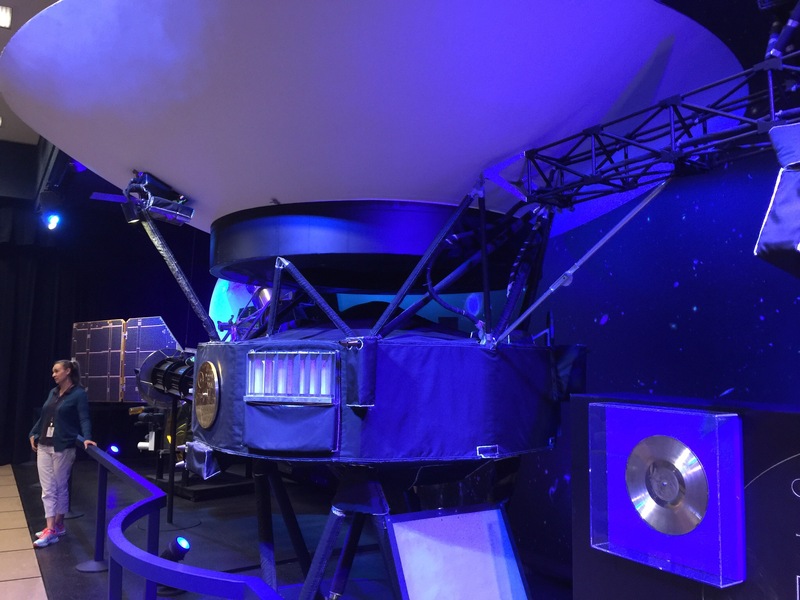 Voyager 1 and 2 continue to operate today returning data from interstellar space. 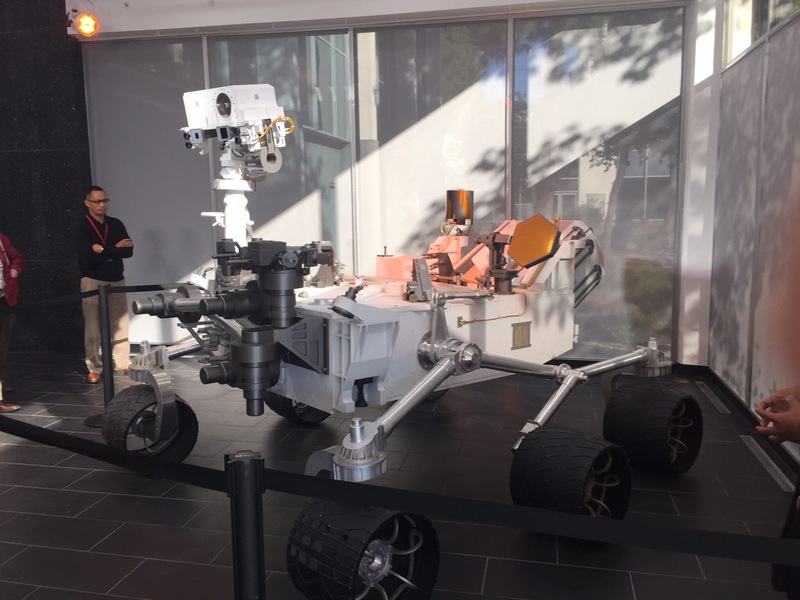 From the auditorium, we headed to a small museum with more examples of JPL’s projects including Mars Exploration Rover Mission and other space craft for exploring the surface of Mars. We were given ample time to look at all of the models and take pictures. But we couldn’t stay all afternoon because there was another group scheduled right behind us. After we were done with the museum we hiked up to the building where the control center lives. 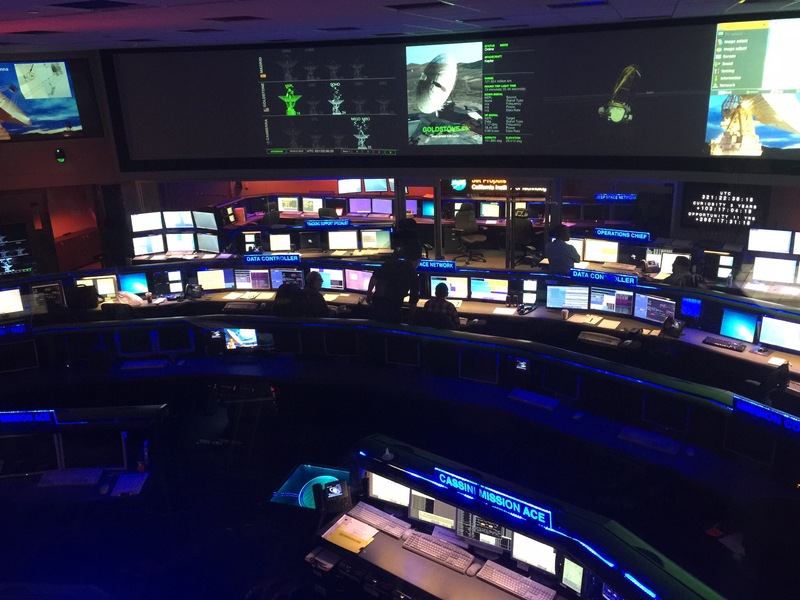 They have a glassed in balcony where visitors can watch the business of managing spacecraft millions of miles from planet Earth. The center is manned 24/7/365. Here are a couple of pictures. By this point in the tour my knees were talking back to me. 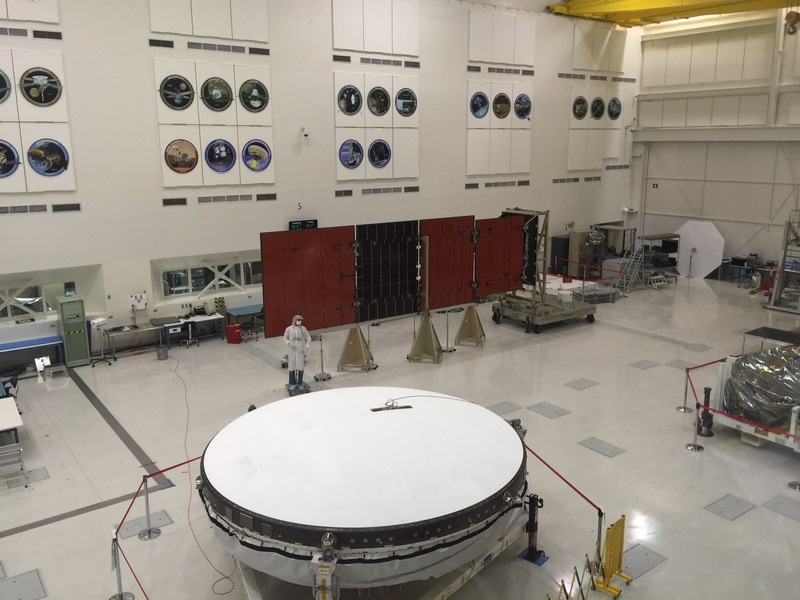 The final stop in the tour was another glassed in balcony for visitors of one of the large clean room assembly areas where robotic space craft are built and readied for their journey to the outer reaches of outer space. On the far wall in the picture below are the mission symbols for all of the space craft that have come through this building. It was a great tour. It was a lot easier than trying to go to the public open house held last month. I am hereby breaking one important rule of mine. My good friend Doug (a DEC retiree) once told me, “Do one thing a day”. And when you get an urge to do a second thing, “Take a nap”. Words to live by indeed. But today, I am going to break that rule and write a second blog post. So, I have been seeing a bunch of FB folks taking the “ALS Ice Bucket Challenge” whereby a person is challenged online either to pour a bucket of ice and water on themselves (videoed for proper evidence, of course. OR, send a check to ALS for $100. So what exactly is ALS? ALS stands for Amyotrophic lateral sclerosis. It is also known as “Lou Gehrigs Disease”. For you millenials, gen-x’ers and other young folk, Lou Gehrig was a baseball player. So my question for you all: All of you that have dumped a bucket of ice water on your head. Have you sent some money to ALSA? I am sure that the ice bucket challenge is helping to bring awareness to their organization. Perhaps, they might need some money, too? By the way here is a pointer to an article in the Boston Herald on how the ice bucket challenge started. Last but not least, here is a pointer to the donation page for ALS. Now, time for that nap.